In the dozen years between finding a relationship with a loving God and going to graduate school to study counseling, I poured myself into one Bible study after another. I was on a quest to heal a life that had a lot of chaos, loss, and boundary violations. God’s goodness surrounded me via Christians and Bible studies, but the fix felt temporary. It filled up some of the broken spots in my life but I could never make that healing stick. One minute I felt God’s love, the next I was on my bed, journaling, crying, and begging God to heal me from low self-esteem and shame. My shelves overflowed with workbooks from the Bible studies I taught or attended. One more Henry Blackaby, one more Beth Moore, another ten years of Bible Study Fellowship, then I’d be cured. But it never happened. People on the outside saw a busy mom surrounded with friends and activities. They didn’t know how badly I struggled with shame, anxiety, depression, and the fear of emotional intimacy. In the summer of 2003, a friend mentioned a new counseling program starting at the nearby university. I hadn’t considered going back to school but in that moment something inside me flickered with excitement. I live in Littleton, Colorado where the Columbine High School shootings happened. The following year—due to a very weird set of circumstances—I got to encourage the firefighters and police officers inside the secured area of Ground Zero in New York City after 9/11. Those experiences put a yearning inside me to understand what would really help people heal. I needed more tools to bring hurting people than just a hug and a casserole. I decided to apply to the program so I could learn how to help people. My graduate program was intense with academic and self-reflective aspects. That time of learning psychology, and examining my life history, was the best but most painful time of my life. When I found relief for my shame, depression, and anxiety so readily, I became angry that I had been stuck for a dozen years. I was frustrated that I had tried to find my emotional healing in scores of Bible studies. Please hear me: I am grateful for every one of those studies and for the Godly people who surrounded me. I just wished I had known about the psychological tools and the safe people that would bring me swiftly into a place where anxiety, depression, and shame loosened their grip. During and after that intense time, I holed away in my basement office and wrote. I wrote about everything that hurt and I wrote about everything that helped. I researched, read, and counseled others. I spent years attending writing conferences. I found an agent then switched to another agent. I wrote queries and proposals. When the first idea didn’t sell, I re-worked it using much of the same material. Finally, the project was sold to a publisher. That was 18 months ago. Editors, agents, copy-editors, friends, authors, and counselors helped me chisel and refine the book. I am so proud of this project. It is not another fluffy book that promises help and then lets you down. It includes anecdotes and research—within a Christian perspective—so that hurting people can find their way to sound mental health and happiness. Check out my book here. Generous and wise. Renewed overflows with gentle remedies for the ailing spirit. And in sharing so much of herself, Lucille Zimmerman reveals herself to be a “wounded healer” in the finest sense of that tradition. If you thought self-care was selfish this is the book that will change your mind. What a wonderful book. For years I thought God was calling me to joy, but never happiness. This is a great book to discover the path to the happiness God has for all of us. Life really can be over-whelming…And who doesn’t want relief or a renewed sense of well-being! As a Psychologist, I can work an entire session with a client, digging in and uncovering great emotional nuggets, only to have them say, “but what do I do?” Lucille gives her readers the “what to do’s”, as she guides and encourages, through personal antidotes, sound theories, biblical applications and doable steps. She creates a path for revitalizing ourselves through her championing of self-care. This book will make you smile as you read known and unknown truths relatable to most all of us. I’m sure you too will be won over to the passion of her heart! Renewed is a delightful book that is easy to read and refreshing to the spirit. In her wonderfully written book, Lucille Zimmerman guides the reader on a journey of discovery and exploration of the human soul. Every chapter is vital and essential to our human development and maturity which offers the reader many invitations to growth that will yield spiritual, emotional and relational healthiness over the course of a life time. Renewed is a wonderful book to read by yourself or as a group study. It has the potential of taking any person or group to new levels of maturity. Renewed is a book I will be recommending to others for many years to come. -Rev. Milan Yerkovich, President, Relationship 180, Co Author, How We Love and How We Love Our Kids, Radio Co Host, New Life Live. This is a book that I want to give to every woman I know. It contains wisdom I wish I had at twenty, and reminders I still need at mid-life, to regularly refill my own well. Lucille shows that in order to have something to give to those we love, we have to replenish our physical, spiritual and emotional energy. With wonderful personal stories and a therapist’s keen insight, Renewed, is a like a cup of cold water to women who are parched for permission to take care of themselves. -Becky Johnson, author of 40 books. Her newest project is a memoir: We Laugh, We Cry, We Cook (Zondervan) written with her daughter Rachel. Lucille Zimmerman’s Renewed is absolutely a must-read for today’s often over-worked, over-stressed, and under-rested woman. As women, we tend to put ourselves last on the list, and in our attempts to take care of everyone around us, often miss out on offering the best of ourselves as we spread ourselves way too thin. Lucille graciously invites us to take an honest look at the ways we take care of ourselves and gives those of us “driven to do” the permission to embrace the balance of nurturing ourselves in order to offer our best to those we love. You will not want to put this book down! (I know I didn’t!) I hope you can tell from the endorsement that I LOVE this book!! 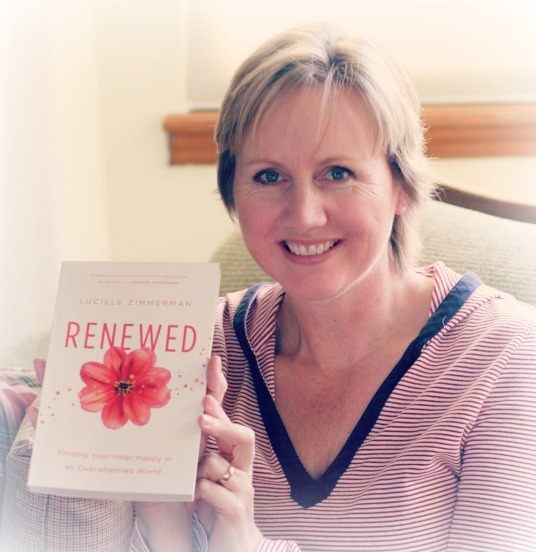 It has been my honor and pleasure to read Lucille Zimmerman’s debut book, Renewed: Finding Your Inner Happy in an Overwhelmed World. I am a young widow on a journey of recovery, and this book was a timely gift, dropped into my life almost as though Lucille had gift wrapped it with me in mind. As I read, I filled pages in my journal with principles, suggestions, and encouragement for self care. Lu’s metaphors are powerful. She is vulnerable and transparent in her writing, even as she models healthy boundaries. Her voice is kind, her guidance is wise, and her heart is gentle. On a day when grief, depression, and sadness threatened to swallow me whole, I wrapped my arms around those emotions and said, “Welcome, old friend. I know how to care for you. Lucille writes, ‘But I believe all people, rich or poor, unloved or cared for, are informed by, benefit from, and deserve the benefits of beauty.’ In the same way, I believe all people, rich or poor, husbands or wives, in sickness or in health, in plenty or in want, deserve the gift of self care. Lucille shows us how to love ourselves. I felt as though this book were a gift wrapped by Lucille herself, and in essence it is: this book is her heart wrapped in words. -Tricia Lott Williford is the author of And Life Comes Back. She blogs at tricialottwilliford.com.